Premium GA Standing is an exclusive grassed area positioned to the right hand side of stage. Tickets are limited. Low beach chairs and rugs are permitted in the GA Lawn area. 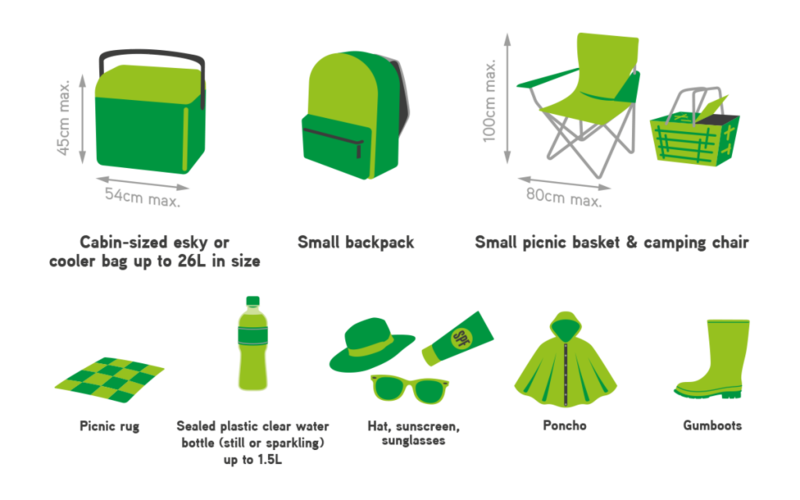 Patrons are also able to bring high backed chairs into the GA Lawn area however these are only permitted at the rear of the venue. Upgrade your ticket to gain access to the exclusive Garden Bar. This upgrade includes; Food Package served for 2 hours, Private Bar (cash only sales) & Private bathroom facilities all in a relaxed area with a limited capacity. Garden Bar ticket is an upgrade only. A concert ticket must also be purchased. Seating in the garden bar is not allocated and may be limited. An email will be sent to all Garden Bar ticket holders within approximately 1 week of the event detailing package menu, confirmed service times & car park pass. Eligible AAMI customers can enjoy exclusive Lucky Club Benefits. Parking is available at every event. A gold coin donation to the parking volunteers is greatly appreciated. Please note parking is at owners risk. Wet weather contingency for parking: Off site parking and a complimentary bus shuttle will be made available in the event that onsite parking is effected by heavy rain fall. Please check our website before you head out to the concert. For bookings please Click Here. What can I bring to RNB Vine Days? A deckchair, picnic rugs, picnic basket, sealed plastic bottled water only (maximum 1 x 1.5L bottle per person). Deck chairs, picnic rugs, baskets and eskies are not permitted in the Premium G.A. Standing area. We do advise that you bring plenty of sunscreen and a hat! Keep in mind that if the weather has been wet during the week a waterproof floor cover may keep you more comfortable, as the lawn may still be damp. What’s prohibited at RNB Vine Days? Strictly NO BYO Alcohol or soft drink. This is a fully licensed event. Metal cutlery (this includes bottle openers), tents or sun shelters, beanbags. The show will still go on unless we advise otherwise. We suggest you bring wet weather clothes and footwear (remember no umbrellas). Keep an eye on our website and on our Facebook for updates before you come to the event. We suggest comfortable casual wear. Please bring something warm & waterproof to put on and/or sit on just in case. Where am I able to smoke? Smoking is ONLY permitted in marked designated smoking areas. Smoking is NOT permitted in the premium seating area. Need further information on the ticket categories? PREMIUM G.A. STANDING – This ticket allows patrons into a fenced area directly in front of the stage. There are NO seats provided. This is an unreserved area that is based on a first-come, first-served basis – Strictly no rugs, deck/camping chairs or hard eskies (soft cooler bags only) in the Premium G.A. Standing area. When purchasing a Premium G.A. Standing ticket you may be quoted a row and seat number, however these are for inventory purposes only and do not reflect an actual seat or location. G.A. LAWN – The G.A. Lawn area is located behind the Premium G.A. Standing area. This is an unreserved area that is based on a first-come, first-served basis – BYO rug or deck chair. When purchasing a G.A. Lawn ticket you may be quoted a row and seat number, however these are for inventory purposes only and do not reflect an actual seat or location. THE GARDEN BAR UPGRADE – you can upgrade your Premium G.A Standing or G.A Lawn ticket s for the Garden bar experience. Enjoy access to a private outdoor retreat including dinner, Bimbadgen merchandise pack and private bar facility. The retreat has a limited view of the stage and this package is purchased in addition to your Premium G.A Standing or G.A Lawn ticket. ARE THERE AGE RESTRICTIONS FOR RNB VINE DAYS? Persons under 18 must be accompanied by a ticket-holding parent or legal guardian at all times. All patrons MUST hold a valid ticket, regardless of age. Keeping the party vibes pumping between each of these a-class sets is RNB Fridays Live’s resident DJ YO! MAFIA, whose signature genre-smashing mixes have seen her tour with the likes of Missy Elliott, TLC and Salt N Pepa (just to name a few!). Grammy-nominated singer-songwriter Amerie will grace the stage at RNB Vine Days with guaranteed party starter ‘I’m Coming Out’. Renowned for her electrifying vocals on fierce tracks ‘1 Thing’, ‘Talkin’ to Me’ and ‘Gotta Work’, Amerie’s charismatic live performance will bring out the inner kween in all, start practicing those tight moves! All Saints have ‘Never Ever’ performed live on our shores until next February – and it’s going to be epic! Smooth harmonies on essential UK #1 singles ‘Never Ever’, ‘Under The Bridge’ and ‘Bootie Call’ will have RNB Vine Days grooving like it’s the ‘90s. Don’t miss the chance to see soulful, party-ready anthems ‘Pure Shores’ and ‘I Know Where It’s At’ live on stage, get your squad together now! Craig David will return to Australia and New Zealand this summer equipped with a full live band. Bringing smooth tunes ‘Walking Away’, ‘7 Days’ and ‘Fill Me In’ to life on the RNB Vine Days stage, Craig David will prove why he’s ‘Slicker Than Your Average’. With endless hits up his sleeve, Craig David’s contagious energy will keep crowds dancing until the sun sets with tracks ‘GOT IT GOOD (ft. KAYTRANADA)’, ‘I Know You (ft. Bastille)’ and certified banger ‘What’s Your Flava’, it’s THE concert you don’t want to miss. elly returns Down Under to transform Australia’s stunning wine regions into the biggest outdoor party. Hot on our radars since 2000’s monumental debut album Country Grammar, the universality of Nelly’s Southern roots transcended rappers of the time with hits ‘Ride Wit Me’ and ‘Country Grammar (Hot…)’. Guaranteed to have crowds grooving on the greens with one hand in the air and a glass of wine in the other when classics like ‘Dilemma (Feat. Kelly Rowland)’, ‘Just A Dream’, ‘The Fix (Feat. Jeremih)’ and ‘Party People (Feat. Fergie)’ are pumping through the speakers, fans are advised to secure tickets ASAP – Nelly’s about to make it ‘Hot In Herre’!